The Radeon 500 series has arrived and, while the 500 series isn’t the fabled “Vega” tech promised to set new performance records, the new RX 580s bring a bump in performance to the popular RX 480. That’s right, the 500 series is based around the 14nm Polaris GPUs from the 400 series, now called Polaris 20 instead of Polaris 10. Where the RX 480 clocked at 1266MHz, the new model comes in at 1340MHz. The rest pretty much stays the same. So maybe they should have called it the RX 485. Or the equivalent of RX 480 Ti. Maybe RX 480 Pu (plutonium), RX 480 Zr (zirconium), I don’t know, pick your favorite element. But “580” made me expect a leap similar to recent generational refreshes from other brands, even though the Radeon 200 to 300 leap was a similar scenario. Vega, once it arrives, will simply be called "RX Vega." 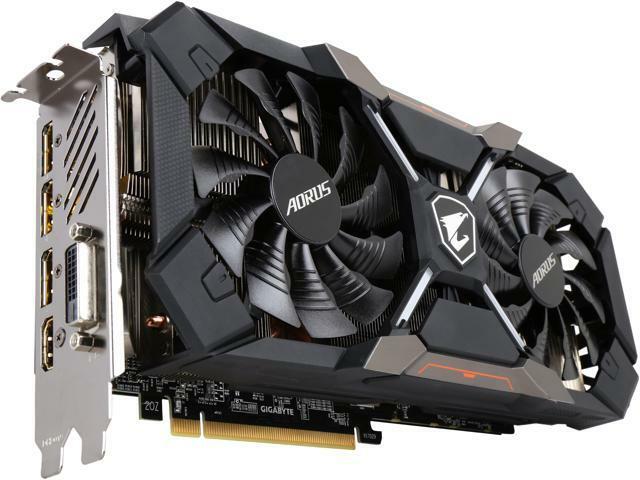 In any case, the card in our hands is the Aorus RX 580 XTR retailing for $259.99. The stock RX 580 with 8GB goes for $229.99. That extra $40 gets you the premium treatment with overclocking, big fans and LEDs galore. The previous RX 480 is in the same price range. There is still a 4GB version, landing around $189. Aorus, if you’re not aware, is GIGABYTE’s new premium gaming brand first seen on ultra performance slim laptops. GIGABYTE will still be selling their own Radeon cards, but the top models now get that Aorus eagle logo and all the fixins. And that’s a good thing because this card is really nice. Aorus/GIGABYTE has been taking no prisoners in their quest to step up their ultra-premium game. Of course, this is a $260 card so “premium” is relative. But myself and others who first held the card was sure it cost way more than it did. Really, they took their best cooler tech found on more expensive cards and stuck it on the Radeon. Interestingly, the Aorus card is a 2.5 unit width rather than the two unit width of typical Radeon models. The big 2.5 cards are usually seen on the ultra performance GPUs like the Aorus 1080 and 1080 Ti Xtreme cards. It’s almost like this was designed for Vega and then the 580 happened. That said, unlike the three 100mm fans in a stacked configuration on the Xtreme 1080 models, the RX 580 has twin 100mm fans. Also like the Xtreme, the RX 580 features the Aorus copper plate around back. The Xtreme version’s machined solid copper block is really thick and quite impressive in person. Here, it’s clearly thinner and, while premium, not the same insane overbuilt quality as the Aorus Xtreme models. And that makes sense -- this is a $260 card, after all. Oh, and there are RGB LEDs. LEDs on the front “X” and the logo. The orange strips are part of the card, so the card isn’t perfectly neutral like their latest mobos, which would have been my preference. Of course, RGB LEDs allows you to pick a color -- there is no rule you must go Rainbow Bright 24/7. For power, the Aorus demands 6+8 pin connectors. Finally, numbers. The Aorus is beefed up over the base RX 580 model, going up to1425MHz boost clock vs the base boost clock of 1340MHz. But then Aorus has an OC mode that gives it a little nudge up to 1439MHz. So another 14MHz, which puts it 99MHz over stock. A little strange the OC is only 1% compared to the much healthier boost clock gain. In our quick tests on Firestrike, the Aorus RX 580 is about a 8% step up from the RX 480 base model edition -- 11,187 vs 10,343 or 7.544% to be precise. Now, this was using the Aorus boost clock of 1425MHz, not 1439MHz -- the prerelease software wasn’t letting us get that last 1% but, based on the numbers we’re seeing, I’m not expecting GPU steroids or anything. As for real world gaming at 1080p resolutions, we saw a 5-10FPS increase in Overwatch and Battlefield. This was using an i5-6600 CPU in our budget gaming rig, which is a better fit for this card. The real story of the Aorus is cooling. During a temp test, the stock RX 480 went from 78c for the first minute to 81c in about 3 minutes. The Aorus RX 580, however, started around 61c and slowly went up to 71c where it stayed. And it did it with barely any noise. It clearly hits these numbers because the 2.5 slot design, 100mm fans and extra thick heatsink. The Aorus model stayed pretty much 10 degrees cooler than reference and much quieter. Since the fans ramp up and down depending on temps, it’s barely audible most of the time. It’s pretty easy to say the cooling is well beyond what this card would need in normal circumstances. The best RX480 overclocks with custom liquid cooling get another 60MHz out of the RX 580 for 1500MHz. And that’s kinda-not-really stable. So it’s pretty safe to say the Aorus is taking the Polaris chip about as far as it can go. Overall, seeing a 10% increase from a base RX 480 to an OC RX 580 isn’t going to get RX 480 owners upgrading. Instead, the RX 580 is a tweaked RX 480 to improve performance for people looking to get into the AMD game. The Aorus RX 580 OC version is definitely putting up some serious competition to the other Radeon models hitting the market. Even though the OC numbers aren't groundbreaking, the Aorus design clearly does justice to the Radeon chip and the thermal performance and noise levels make the couple extra bucks for the Aorus worth it. Now where's that Aorus Vega action?